Does CBD Interact with Medications? Whenever you take a supplement, it’s a good idea to find out whether it has any interactions with your prescription drugs. Supplements can interact with drugs in different ways, ranging from making them more potent (in some cases dangerously so) to nullifying their effects. Is this a concern with CBD? Before we answer that question, first we need to explain a little bit about how drugs are metabolized (or broken down). Your body relies on enzymes to metabolizes everything it takes in — whether that’s a medicine, a supplement, a food or a drink. Influence enzyme activity, and you influence drug potency. CBD inhibits, or blocks, a group of liver enzymes called cytochrome P450, which are involved in metabolizing many drugs. That means it does interact with the way some medications are metabolized by the body. Interestingly enough, compounds in grapefruit do the same thing. That’s why you may have heard that people can’t eat grapefruit before or after taking certain medications. 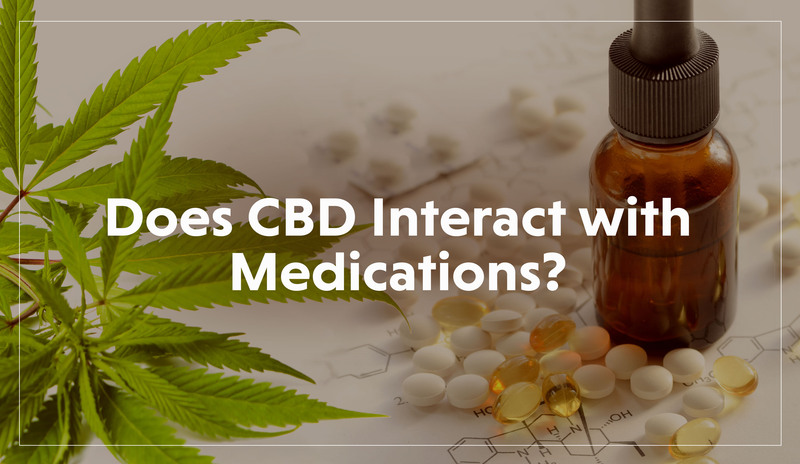 Now that you know CBD can affect medications that are metabolized by P450 enzymes, you may be wondering exactly how. Does it increase or diminish their potency? The answer is that CBD can affect the potency of medications in either direction, making them stronger or weaker. Unfortunately, researchers haven’t yet determined which doses of CBD may interact with the metabolism of different drugs. A 2013 study found no interactions along the CYP metabolic pathway for doses of up to 40 mg of CBD. But a later study found doses as low as 25 mg of CBD did block the metabolism of an epilepsy drug. This uncertainty is why it’s important to consult with your health care provider about taking CBD if you are on any prescription medications. Your doctor may want to monitor your blood levels of medication to make sure you’re getting neither too much nor too little of your prescribed medicine, but just the right amount. Check out our extensive list of FAQs or watch our free webinar by clicking below.